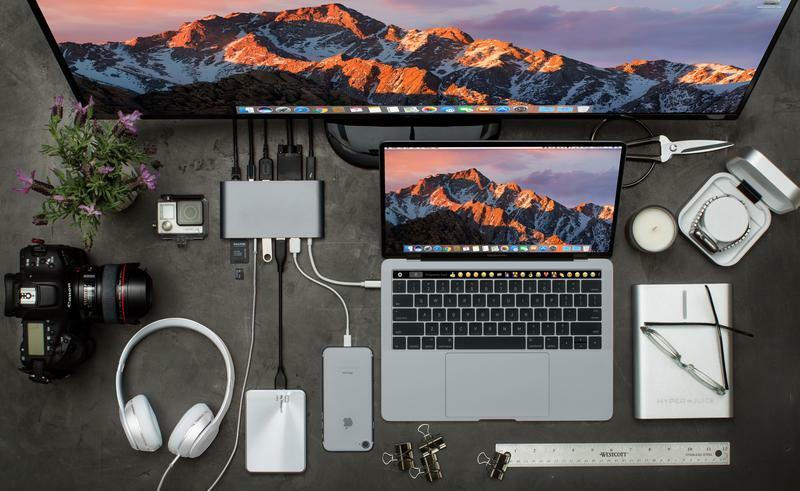 Through the use of a single USB-C on your device, this Compact Ultimate hub will add 11 more connectors to your PC or Macbook, which includes VGA, HDMI, USB Power delivery, Ethernet, USB and many more. You might have already noticed that with each new generation of laptops or MacBooks, there is usually one feature or port on the actual device that gets discontinued. This can be very frustrating and expensive for some, as it means your brand new shiny device loses compatibility with your already-owned accessories, such as monitors or peripherals. 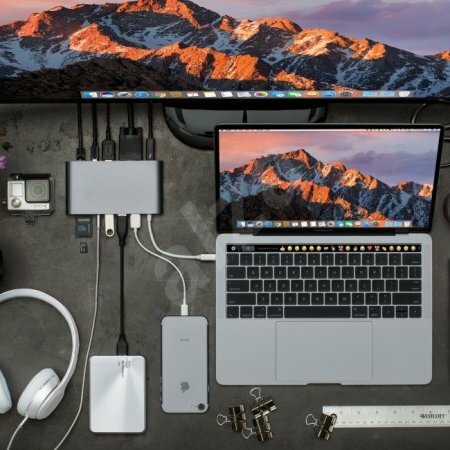 HyperDrive Ultimate USB-C Hub has been specifically designed to be compatible with both MacBook and PC laptop devices which come with an USB-C port. 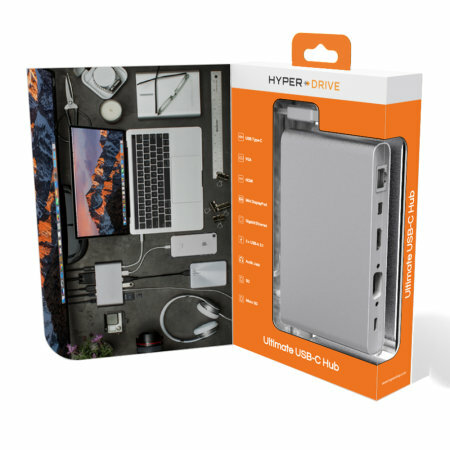 With a compact 11-in-1 design, HyperDrive Ultimate adds various extra ports, meaning you will not have to constantly carry around or store multiple adapters to stay productive. 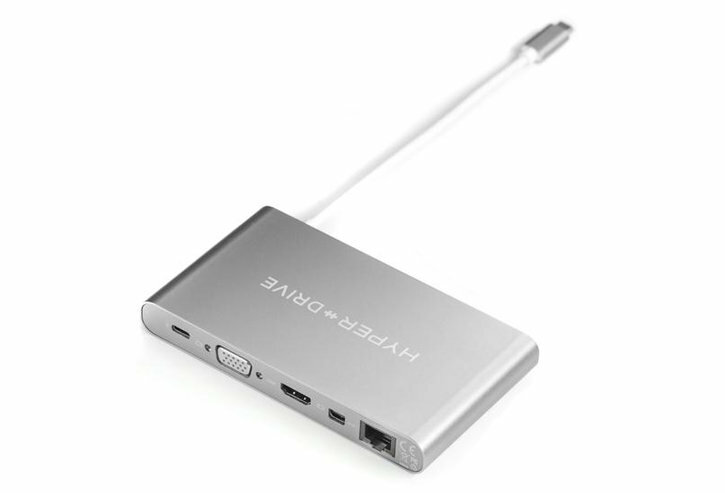 The hub features a pass-through USB-C power delivery (PD) protocol, which allows it to deliver an impressive 60W of power to the hub, which is enough to charge your power-hungry laptop's or MacBook's battery, as well as your peripherals. No matter if you have the 13" or 15" MacBook Pro, or any other standard Windows laptop, the HyperDrive will deliver the optimal power output. As USB-C devices are becoming increasingly popular, the HyperDrive features a USB-C port meaning you'll be able to connect and charge any of your other USB-C devices including smartphones or any other devices which feature USB-C port. Add 3 ultra-fast USB 3.1 ports to your computer and connect a wide range of media devices, which include USB memory sticks, external USB hard drives, printers and other equipment. The latest USB generation ports will ensure ultra-fast data transfer speeds of up to 5Gb/s. 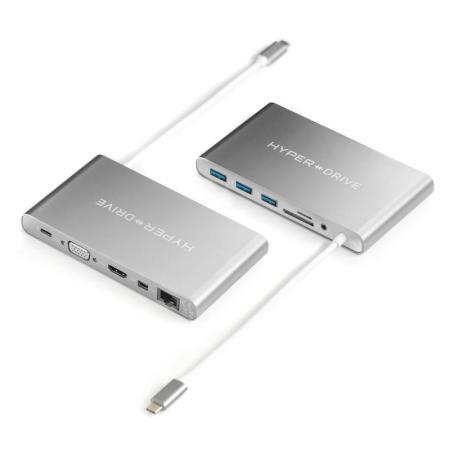 The HyperDrive Ultimate Hub features an HDMI video output which supports 1080p@60Hz or up to 4K@30Hz video output, meaning you'll be able to connect your MacBook or USB-C compatible laptop to an external display, making this adapter ideal for those in regular meetings and conferences. Along the HDMI output, HyperDrive Ultimate Hub features a Mini DisplayPort video output which also delivers the identical 1080p @ 60Hz or up to 4K @ 30Hz video outputs, thus resulting in a greater compatibility with your existing monitors and projectors. If none of the video outputs mentioned above work for you, HyperDrive Ultimate hub goes above and beyond to ensure you have at least one video output that is compatible with older devices. The included VGA port will allow you to connect to most, if not older monitors or TVs with a maximum 480p@30Hz. 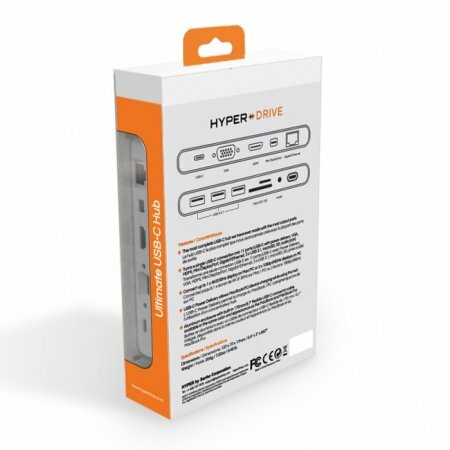 Additionally, this HyperDrive Ultimate Hub features SD and microSD card reader slots for transferring data from devices such as games consoles or cameras to your laptop, making this adapter perfect for photographers. It is no surprise that a wired Internet connection is usually way faster and much more stable than the Wireless Internet connection (Wi-Fi), which most of used are really used to. This HyperDrive Ultimate Hub features a dedicated 1 Gigabit Ethernet female port, which allows you to connect to your wired Internet connection at home or work. In order to make the most out of your device and HyperDrive Ultimate USB-C hub, you can use the built-in 3.5mm audio port to stream the audio output through your 3rd party speakers. With its lightweight and compact design, the HyperDrive Hub is perfect for carrying around in your pocket or bag, without adding any unnecessary bulk. The HyperDrive Ultimate Hub has been crafted from CNC precision milled aluminium, allowing it to connect and blend in perfectly with your stunning new MacBook - this stylish hub will not look out of place, when in use. 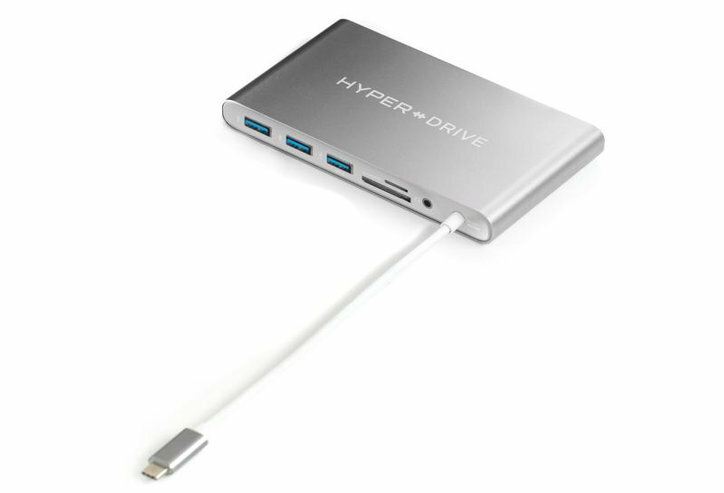 As the HyperDrive Ultimate Hub makes use of a relatively popular USB-C port, you'll be able to use it on most of the USB-C enabled devices, such as Macbooks, Macbook Pros, and other Windows laptops.